← An alternative to secular Christmas music: That Detroit Soul! I’m sure most of you are already aware of the humorous tweets physicist Neil deGrasse Tyson sent out on Christmas. If you’re not, I’m linking a news article about them here. The linked article comes from Fox News, which I was pleasantly surprised to learn allows comments (last time I checked, about two years ago, they didn’t). So I did that thing I do and, after reading the article, I clicked on the comments section. And, whoa, was I entertained! Fox News doesn’t show all of his tweets. To see the ones they omitted, click here. First, to sum up: Tyson tweeted a series of observations about Christmas using humor to entertain his followers on Twitter. None of them made fun of Christians; they did, however, make fun of Christmas. But the “mockery” was hidden beneath facts. The only tweet that resembles an attack against Christians is actually making fun of consumerism. Furthermore, the tweet Fox omitted praised Santa for knowing about physics. * Not everyone agrees with me. Many of Fox’s readers jumped in on the comment board to unleash their fury and racism. Below I’ve screen capped some of the offending responses. *The tweet about Santa using a red nosed rain deer as opposed to a blue nosed rain deer is based on light scattering. Longer wavelengths (red) penetrate through fog much easier than shorter wavelengths (blue). I’m not certain why Fox News would leave out this tweet. Um. Yes, I believe in my brain. I know I have one. I’ve had it scanned by MRI and CT machines. This is the dumbest comment in the lot. I considered omitting it from this post due to possibly being Poe, but I decided to let you decide. Neil is married to a woman and has two children. I’m pretty sure he’s not gay. I think you’re confusing him with Neil Patrick Harris. Why the quotation marks? Tyson holds a Ph.D in astrophysics from Columbia University. That is literally highly educated. Some clearly didn’t peruse the scientific literature prior to posting. So what if Newton believed in god? That has nothing to do with his contributions to science or Tyson’s admiration of him. Funny, yes. Then again this assumes Tyson is a “progressive,” whatever he means by that. Something tells me Tyson and Sharpton are at opposite ends of the theological spectrum. I wish I could say that these comments were extreme outliers in a forum of mostly reasonable responses to an article on Fox News about Tyson, but unfortunately they weren’t. I’m very aware that Fox News is where some of the right-of-center folks end up getting their news, so I was not surprised at the level of vitriolic words aimed at one of our most highly esteemed thinkers. I just wish they didn’t take his humor as personal attacks against them. 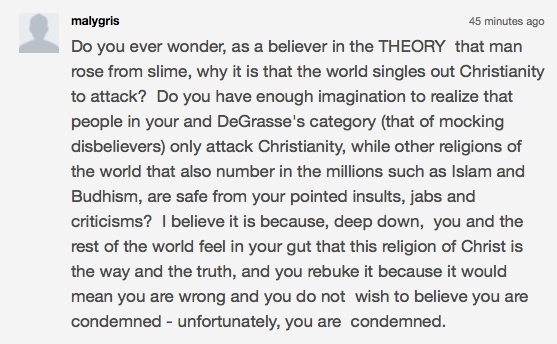 This entry was posted in Uncategorized and tagged Atheism, Christianity, Christmas, Fox News, God, Jesus, Neil deGrasse Tyson, Religion. Bookmark the permalink. I just figured Tyson was trolling, I don’t think we can really claim he was 100% free of an ulterior motive or that he didn’t want a fuss (probably didn’t expect such a fuss though) as he is a media personality. Any publicity is good publicity, and Cosmos have him a certain market share. I applaud his capitalism! I guess this disappointed me a bit because it shows he isn’t above that type of juvenile thing, and I’m sad people dignified him with a response,or maybe I idealisticly miss some imaginary era when scientist just talked about science, I don’t want their opinions but their research is welcome. An antiquated old theory by a guy named Darwin who never heard of DNA becomes Tysons Cosmos which becomes atheist propeganda which becomes Kim Jong Un’s favorite show.